LINCOLN -- Christine Linnea Lansford, 91, died Saturday, Feb. 12, 2005, at 11:50 p.m. at the Christian Village in Lincoln. Her funeral will be Saturday, Feb. 19, at the First United Methodist Church in Lincoln, with the Rev. Jame Hahs officiating. Visitation will be one hour prior to the service. Mrs. Lansford was trust fund clerk in the business office at the Lincoln Developmental Center for many years. She was born April 1, 1913, at Puritan, Mich., to Arvid and Kathleen Berg Nelson. She married Charles P. Lansford on Nov. 17, 1931, in Chicago. He died Sept. 14, 1997. She is survived by three sons, Richard N. (and Elizabeth) Lansford of Littleton, Colo., Charles L. (and Annette) Lansford of Champaign and James E. (and Elaine) Lansford of Chillicothe, Ohio; one daughter, Virginia (and Emrik) Carlson of Lombard; nine grandchildren; seven great-grandchildren; and one brother, Henry Nelson of Woodbury, N.J.
She was preceded in death by one brother and three sisters. She was active in the First United Methodist Church of Lincoln and the Logan County senior citizens center, The Oasis. Memorials may be made to the First United Methodist Church or Lincoln Christian Village. Click here to send a note of condolence to the Lansford family. LINCOLN -- Blanche L. Boss, 96, died Saturday, Feb. 12, 2005, at 11:10 p.m. at Lincoln Christian Village. Visitation will be from 4 to 6 p.m. Thursday at Holland and Barry Funeral Home. Her funeral will be at 10:30 a.m. Friday at the First Presbyterian Church, with Pastor Phillip Blackburn officiating. Mrs. Boss was a homemaker. She was born Sept. 5, 1908, in Shamrock, Mo., to Irvin Leo and Maggie Hereford Gray. She married Marvin H. Boss on Sept. 1, 1928, in Clayton, Mo. He died Dec. 25, 1999. She is survived by two sons, Marvin H. Boss Jr. of Lincoln and Roger L. (and Connie) Boss of Lincoln; five grandsons, Jeff (and Martha) Boss of Morton, Brad Boss of Fort Campbell, Ky., Brock Boss of Normal, Brennan Boss of Lincoln and Brayton Boss of Normal; one granddaughter, Carol Boss of Lincoln; six great-grandchildren; two great-great-grandchildren; and one sister, Edna Gray of Wellsville, Mo. Besides her parents and her husband, Marvin Boss Sr., she was preceded in death by one brother, Tony Gray, and one granddaughter, Diane Lynn Nye. She was a member of the First Presbyterian Church of Lincoln, Presbyterian Church Women's Association, Miriam Circle, Kooshnah, Lincoln Woman's Club and Abraham Lincoln Memorial Hospital Auxiliary. She was also very active in the Washington School PTA from 1945 to 1950. Memorials may be made to the First Presbyterian Church and Lincoln Christian Village Nursing Home. McLEAN -- Meretta J. "Pat" Ford, 77, of McLean, died Sunday, Feb. 13, 2005, at 4:29 p.m. at OSF St. Joseph Regional Medical Center in Bloomington. Her funeral will be at 11 a.m. Wednesday at Quiram Funeral Home, Atlanta, with Tony Billingsley officiating. Visitation will be one hour prior to the service. Burial will be in McLean Cemetery. Mrs. Ford was employed at Dixie Truckers Home for several years and later worked at BroMenn Regional Medical Center in Normal for 22 years. She was born Oct. 1, 1927, at Sturgis, Mich., to William and Anna Louise Collins Boals. She married Eugene C. Ford on Nov. 19, 1955, at Bloomington. He died May 21, 1990. She is survived by two daughters, Nancy (and Tim) Smith of Danvers and Judy Ford of Atlanta; two grandchildren; Matthew (and Tracy) Gresham of Bloomington and Kelly Spaulding of McLean; and three great-grandchildren. SPRINGFIELD -- James M. Cunningham Sr., 98, formerly of Lincoln, died Sunday, Feb. 13, 2005, at 1:10 a.m. at Lewis Memorial Christian Village. Visitation will be from 4 to 7 p.m. Tuesday at Fricke-Calvert-Schrader Funeral Home in Lincoln. His funeral will be at 10 a.m. Wednesday at the funeral home, with Pastor James M. Cunningham Jr. and Pastor Bob Florence officiating. Burial will be in Potomac Cemetery, Potomac, with a graveside service at 2:30 p.m. Wednesday. Mr. Cunningham retired after 39 years of teaching in primary and secondary schools in various Illinois counties. He worked for the state of Illinois for 10 years at Lincoln Developmental Center as a technician. He was born June 18, 1906, at Henning to Charles Wesley and Lillie Wyman Cunningham. He married Esther Marjorie Burkhart in February 1929. He died Nov. 29, 1959. He married Hilda Graham Huston on Feb. 2, 1962, in Bloomington. She died March 27, 1998. He is survived by one son, James (and Blanche) Cunningham Jr. of Omaha, Neb. ; four daughters, Rhea (and Larry) Martincic of Lincoln, Eva Quinn of Heyworth, Wauneta (and Don) Benton of Herrin and Mary (and Bob) Florence of Springfield; 15 grandchildren; 26 great-grandchildren; and four great-great-grandchildren. He was a member of Jefferson Street Christian Church, where he served as elder. He was also a member of Oasis Fun-O-Leers and volunteered as a ventriloquist with "Grandpa," his puppet. He was an avid horseman. Memorials may be made to the ministerial scholarship fund at Lincoln Christian College. Click here to send a note of condolence to the Cunningham family. 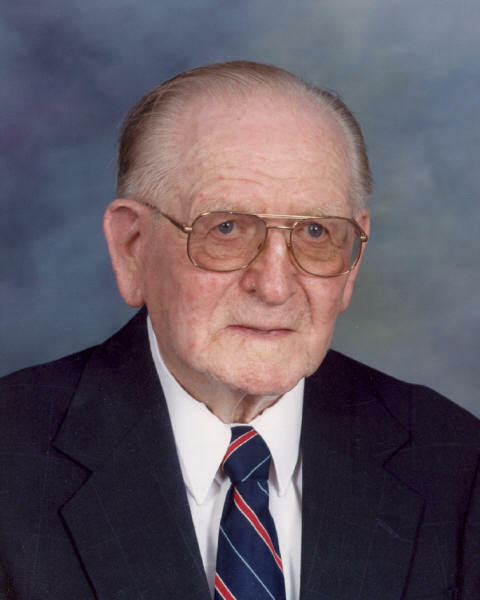 LINCOLN -- Herbert H. Deverman, 95, a Lincoln resident since 1918, died Saturday, Feb. 12, 2005, at 5:45 p.m. at Abraham Lincoln Memorial Hospital. His funeral will be at 10 a.m. Thursday at Zion Lutheran Church in Lincoln, with the Rev. Mark Carnahan officiating. Visitation will be from 4 to 7 p.m. Wednesday at Holland and Barry Funeral Home and from 9 to 10 a.m. at the church on Thursday. Mr. Deverman was a farmer and worked at One Hour Martinizing Dry Cleaners. He retired in 1974. He served in the U.S. Army for 44 months in the Pacific Theatre during World War II. He was born April 28, 1909, at Bath to George and Clara Dierker Deverman. He married Margaret Yagow in Tacoma, Wash., on Feb. 14, 1943. He is survived by his wife; one son, Allen (and Sandra) Deverman of Monkton, Md. ; one daughter, Claire (and Edward) Koehler of Lincoln; four grandchildren, Beth Koehler of Springfield, Todd (and Annie) Koehler of Lincoln, Nicholas (and Stephanie) Koehler of Bella Vista, Ark. and Kelly Deverman of Monkton, Md. ; two great-grandchildren, Madelyn and Trent Koehler of Lincoln; and one sister, Marie (and George) Ahrens of Lincoln. He was preceded in death by two brothers, Walter and George Deverman, and one sister, Mabel Deverman. He was a member of Zion Lutheran Church in Lincoln, financial secretary for the church, secretary-treasurer for the building fund for the education building of the church, taught Sunday school for 15 years and was president of the Walther League. Memorials may be made to the building fund at Zion Lutheran Church and to Zion Lutheran School. ATLANTA -- Vera E. Miller, 89, of Lincoln, formerly of Atlanta, died Saturday, Feb. 12, 2005, at 8:27 a.m. at the home of her granddaughter in Atlanta. She had resided at the Christian Village in Lincoln for the last two years. Her funeral was Tuesday morning at the Atlanta United Methodist Church, with the Rev. Steve Anderson officiating. Visitation preceded the service. Quiram Funeral Home handled arrangements. Mrs. Miller was employed at Kroger in Atlanta and later in Lincoln for 25 years. She was born Nov. 11, 1915, at Ottawa, to Enoch and Belle Severson Enockson. She married Donald E. Miller on Nov. 30, 1934, at Marseilles. He died Oct. 19, 1994. She is survived by one daughter, Delores (and Merlin) Billington, of Atlanta; 10 grandchildren; 22 great-grandchildren; 13 great-great-grandchildren; and several nieces and nephews. She was also preceded in death by two sons, four brothers and two sisters. She was a member of the Atlanta United Methodist Church. Memorials may be made to the church or Lincoln Christian Village. LeROY -- Lynn D. Adams, 90, formerly of Emden, died Saturday, Feb. 12, 2005, at 8:15 a.m. at LeRoy Manor Nursing Home. His funeral will be at 11 a.m. Wednesday at Peasley Funeral Home in Lincoln, with the Rev. Marion Henderson officiating. Visitation will be from 10 until 11 a.m. at the funeral home. Burial, with military rites, will be in Zion Cemetery, rural Lincoln. Mr. Adams farmed in the Emden area for 25 years. He was superintendent for the Logan County Cemetery District from 1972 until his retirement in 1987. He was born Aug. 20, 1914, in Montevideo, Minn., to Mart and Bertha Workman Adams. He married Ruth Ida Leesman on Dec. 1, 1943, at Lincoln Christian Church in Lincoln. She died April 28, 1998. He is survived by one daughter, Karen (and Gerry) Rawlins of Atlanta; one son, Roger (and Margie) Adams of Pensacola, Fla.; two grandsons, Doug Rawlins of Atlanta and Joshua Adams of Pensacola, Fla.; two granddaughters, Kathy (and Ernie) Reynolds of Bloomington and Gina Adams of Pensacola, Fla.; one great-grandson, Andrew Jamison Reynolds of Bloomington; and one brother, Owen Adams of Minier. He was also preceded in death by four brothers. He was a member of the Lincoln Christian Church and Emden American Legion Post 506. Memorials may be made to Armington Fire and Rescue Squad. Click here to send a note of condolence to the Adams family.